Jakarta (Indonesia) – December 22, 2017 (travelindex.com) – Global hospitality management chain, Swiss-Belhotel International, is celebrating once again after it was named “Indonesia’s Leading Global Hotel Chain” for a record-breaking seventh awards recently at the Indonesia Travel and Tourism Awards (ITTA) 2017-18. 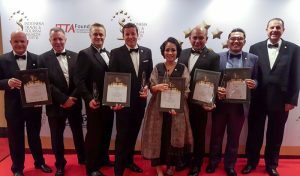 In a glittering award ceremony held in Jakarta on 11th December 2017, Swiss-Belhotel International was presented with the award in recognition of the quality of its hotel portfolio in Indonesia with four properties awarded by the judges. The voting process included an online ballot that generated more than 50,000 responses, followed by expert assessments from the Board of Advisors and BINUS Business School. The winning hotels were Swiss-Belboutique Yogyakarta (Indonesia’s Leading Boutique Hotel – Yogyakarta), Swiss-Belhotel Airport Jakarta (Indonesia’s Leading Airport Hotel – Jakarta), Grand Swiss-Belhotel Medan (Indonesia’s Leading 5 Star Hotel – Medan) and Swiss-Belinn Luwuk (Indonesia’s Leading Hotel – Central Sulawesi). Since arriving in Indonesia 25 years ago, Swiss-Belhotel International has built an extensive collection of almost 70 hotels and resorts all across the country. This makes Indonesia the hotel group’s largest market globally. “I would like to thank our entire Indonesian team – at our regional and group offices and at all of our hotels nationwide. We could not succeed without each and every one of them, and this award is a testament to the passion and professionalism they demonstrate on a daily basis,” added Mr Faull. “We look forward to unveiling even more exciting Indonesian hotels in the future, as we continue to expand our presence across the country. Our mission is to provide high-quality accommodation to guests at all price points, and to bring world-class services and standards to every corner of the Indonesian archipelago,” he said. Swiss-Belhotel International now operates a broad collection of hotels, resorts and residences all across Indonesia. These include a choice of brands, from upper-upscale Grand Swiss-Belhotel to classic Swiss-Belhotel, extended-stay Swiss-Belresidences and economy Swiss-Belinn. The company is also rolling out its exciting new budget brand, Zest Hotels, in key Indonesian destinations. The eighth edition of the Indonesia Travel and Tourism Awards (ITTA) was organised by the ITTA Foundation, a non-governmental organisation dedicated to the growth and development of Indonesian tourism. ITTA 2017-18 recognised the country’s best hotels, resorts, suites, villas, tourism agencies, travel agents, tourist attractions and other tourism stakeholders. Book your Swiss-Belhotel in Indonesia and around the world at best rates available. Pay at the hotel. Book now at HotelWorlds.com! Swiss-Belhotel International currently manages a portfolio of more than 145* hotels, resorts and projects located in Cambodia, China, Indonesia, Malaysia, Philippines, Vietnam, Bahrain, Egypt, Iraq, Kuwait, Jordan, Oman, Qatar, Saudi Arabia, United Arab Emirates, Australia, New Zealand, Bulgaria, Georgia, Tanzania and Turkey. Awarded Indonesia’s Leading Global Hotel Chain for six consecutive years, Swiss-Belhotel International is one of the world’s fastest-growing international hotel and hospitality management groups. The Group provides comprehensive and highly professional development and management services in all aspects of hotel, resort and serviced residences. Offices are located in New Zealand, Hong Kong, Australia, China, Europe, Indonesia, United Arab Emirates, and Vietnam (numbers may fluctuate).